Humphrey DeForest Bogart was born on December 25, 1899 (some sources say January 23, 1900) in New York City. He was the son of a noted Manhattan surgeon, Dr. Belmont Bogart (1867-1934), who was secretly addicted to opium. His mother, Maud Humphrey (1865-1940) was a popular magazine illustrator. Humphrey probably learned chess in 1912. His father taught him chess during their stay at their summer home in Canandaigua Lake, near Rochester, New York. In 1918 he enlisted in the U.S. Naval Reserve. He is called to active service, but World War I is nearly over. After his discharge from the Navy in 1919 he returned to New York City and continued to play chess. He was expert strength. He finally approached a friend of the family for employment and got a job as an office boy at a theater. In 1920 he switched to acting and appeared in a play called Swiftly in 1922. He had minor roles on Broadway during this time. He married his first wife, Helen Menken, in 1926, but divorced her after less than a year. In 1928 Bogart married his second wife, Mary Philips. They were divorced in 1937. In 1929, after the stock market crashed, Bogart hustled chess players for quarters in New York City parks and for dimes against all comers at Coney Island. Bogart said he preferred to play chess rather than poker, because no one could cheat. In 1930 Bogart travelled to Hollywood, but only had minor parts. He played chess and got involved in California chess organization during that time. He returned to New York in 1931 and couldn't find a job. He earned money by hustling chess in an arcade window, taking on all challengers. Bogart earned money for his meals by hustling chess at the numerous “sportslands” on Sixth Avenue in Manhattan. For a bet of 50 cents a game, he played all comers. If he won, he got one dollar. He won more than he lost. At an arcade, he would sit in a window playing chess for a dollar a game. He usually played about 40 people a day. He was known to have played chess in Times Square in 1933. In 1935 Bogart was cast as a gangster in The Petrified Forest and it became a big hit in 1936. This role lifted him out of poverty and he no longer had to hustle at playing chess. In 1938 he married his 3rd wife, Mayo Methot. In 1942 Bogart was the star (Rick Blaine) of CASABLANCA (a role that Ronaled Reagan and George Raft turned down). It had several chess playing scenes. CASABLANCA was rated as the second best movie ever made by the American Film Institute. CASABLANCA won the Best Picture of 1943. It became one of the biggest money-maker movies ever. 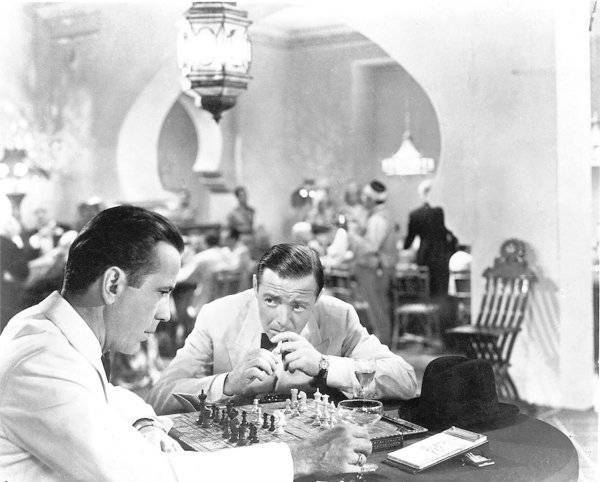 All the chess playing scenes in CASABLANCA were Bogart's idea. He wanted a character that was a chess player that drank too much. There were some chess scenes of Bogart studying a chess game while Peter Lorre looked on that did not make the film. The character Rick Blaine always beat police officer Captain Louis Renault (Claude Rains) at chess. A blooper in the movie is that a knight disappears in the opening chess game. Bogart, at the time, was analyzing a position in the French Defense from one of his correspondence games. One story is that somebody knocked over some pieces between filming and the stage hands set them up again, overlooking a knight. There were four different shots of the chessboard with different positions. During the filming of CASABLANCA, Bogart mostly played chess with Paul Henreid (1908-1922), who beat Bogart in all of their games. In the film, Henreid played Victor Laszlo, the Czech Resistance leader and the husband of Ilsa Lund (Ingrid Bergman). Bogart also played several games with crew members and cast (including Claude Rains) off the set or during takes. After CASABLANCA Bogart was playing a lot of correspondence chess with GIs overseas or in veterans’ hospitals in 1942. In 1943 he was visited by the FBI who prevented him from playing any more correspondence chess. The FBI was reading his mail and thought that the chess notation he was sending to Europe were secret codes. In 1944, Bogart appeared in Passage to Marseille. Between takes, he was photographed playing chess with the film crew and cast members. In May, 1945 Bogart divorced Mayo Methot and married 20 year old Lauren Bacall 11 days later (he was 45). She was also a chess player. In 1945 Bogart and his new wife, Lauren Bacall, appeared on the cover of the June-July, 1945 issue of Chess Review magazine. He was playing Charles Boyer in Boyer’s dressing room as Lauren Bacall looked on. The game was played between takes of “The Confident Agent.” Another picture of Bogart, Boyer, and Herman Steiner (1948 US chess champion) appeared in the magazine. Bogart was a tournament director for the United States Chess Federation and the California State Chess Association. He helped sponsor the August 1945 Pan American Chess Congress in Los Angeles and was selected as the Master of Ceremonies. In June 1945, Bogart was interviewed by Silver Screen magazine. When asked what things mattered most to him, he replied that chess was one of those things that mattered most to him. He said he played chess every day between takes when he made movies. In 1946 Bogart lost a match and $100 to the restaurateur, Mike Romanoff (1890-1972). That evening Bogart went home, and then phoned Romanoff to play one more game over the phone for another $100. Romanoff agreed, and then lost in 20 moves. Bogart just happened to have former US chess champion Herman Steiner over his house, and Bogart's moves were really Steiner's moves. The Romanoff's restaurant on Rodeo Drive in Beverly Hills was Bogart's main hangout. Bogart owned the second booth from the left corner as you entered the restaurant. No one else could sit there. If Mike Romanoff was there, he and Bogart would always play chess at that table. Romanoff liked to call himself "Prince Michael Alexandrovitch Dmitri Romanoff." In 1947 Bogart was the highest paid actor in the world (making $500,000 a year). He started his own production company, Santana Pictures. One of Bogart's biographers said that Bogart rated his friends on their ability to play chess. In 1949 Humphrey Bogart and Lauren Bacall had a son, Stephen. In 1952 they had a daughter, Leslie Howard. In March, 1952 Bogart was in San Francisco and played a game with George Koltanowski. Koltanowski played blindfolded and defeated Bogart in 41 moves. Bogart had earlier played Sammy Reshevsky when Reshevsky was giving a simultaneous exhibition, and drew him at Romanoff's Restaurant in Hollywood. In 1952 Bogart won the Best Actor Oscar for his character in The African Queen. He and Katherine Hepburn played chess while making The African Queen in Stanleyville. Bogart claimed to be the strongest chess player among the Hollywood stars. He did lose to Art Buchwald, columnist for the New York Herald, when they played. Bogart got Frank Sinatra interested in chess. Art Buchwald once wrote that he beat Bogart in a game of chess. Grandmaster Svetozar Gligoric once met Bogart and said that Bogart was a very capable player. They didn’t play, but they both analyzed together some of Gligoric’s games from the 1953 Candidates Tournament. Bogart died in his sleep on January 14, 1957 at the age of 57. He had cancer of the esophagus. When he died, he had a chessboard next to his bed. He would play friends when they came by or analyzed chess games. Lauren Bacall said he was always an avid chess player to the very end. Bogart appeared in over 75 films in 26 years. His chess playing buddy, Mike Romanoff, was his pallbearer. Bogart - Sydney Greenstreet, Hollywood 1942 result: 1-0 in favor of Bogart during the filming of "Casablanca." Bogart - Charles Boyer, Hollywood 1945 result: 1-0 in favor of Bogart during the filming of "The Confidential Agent."